After months of anxiety among digital rights campaigners such as the Open Rights Group and the Electronic Frontier Foundation, the European Parliament has voted 318-278 against fast-tracking a particularly damaging set of proposed changes to copyright law. There will be a further vote on September 10, so as a number of commentators are reminding us on Twitter, it's not over yet. The details of the European Commission's alarmingly wrong-headed approach have been thoroughly hashed out for the last year by Glyn Moody. The two main bones of contention are euphoniously known as Article 11 and Article 13. Article 11 (the "link tax") would give publishers the right to require licenses (that is, payment) for the text accompanying links shared on social media, and Article 13 (the "upload filter") would require sites hosting user content to block uploads of copyrighted material. In a Billboard interview with MEP Helga Trüpel, Muffett quite rightly points out the astonishing characterization of the objections to Articles 11 and 13 as "pro-Google". There's a sudden outburst of people making a similar error: Even the Guardian's initial report saw the vote as letting tech giants (specifically, YouTube) off the hook for sharing their revenues. Paul McCartney's last-minute plea hasn't helped this perception. What was an argument about the open internet is now being characterized as a tussle over revenue share between a much-loved billionaire singer/songwriter and a greedy tech giant that exploits artists. Yet, the opposition was never about Google. In fact, probably most of the active opponents to this expansion of copyright and liability would be lobbying *against* Google on subjects like privacy, data protection, tax avoidance, and market power, We just happen to agree with Google on this particular topic because we are aware that forcing all sites to assume liability for the content their users post will damage the internet for everyone *else*. Google - and its YouTube subsidiary - has both the technology and the financing to play the licensing game. But licensing and royalties are a separate issue from mandating that all sites block unauthorized uploads. The former is about sharing revenues; the latter is about copyright enforcement, and conflating them helps no one. The preventive "copyright filter" that appears essential for compliance with Article 13 would fail the "prior restraint" test of the US First Amendment - not that the EU needs to care about that. As copyright-and-technology consultant Bill Rosenblatt writes, licensing is a mess that this law will do nothing to fix. If artists and their rights holders want a better share of revenues, they could make it a *lot* easier for people to license their work. This is a problem they have to fix themselves, rather than requiring lawmakers to solve it for them by placing the burden on the rest of us. The laws are what they are because for generations they made them. Article 11, which is or is not a link tax depending who you listen to, is another matter. Germany (2013) and Spain (2014) have already tried something similar, and in both cases it was widely acknowledged to have been a mistake. So much so that one of the opponents to this new attempt is the Spanish newspaper El País. My guess is that those who want these laws passed are focusing on Google's role in lobbying against them - for example, Digital Music News reports that Google spent more than $36 million on opposing Article 13 - is preparation for the next round in September. Google and Facebook are increasingly the targets people focus on when they're thinking about internet regulation. Therefore, if you can recast the battle as being one between deserving artists and a couple of greedy American big businesses, they think it will be an easier sell to legislators. But there are two of them and billions of us, and the opposition to Articles 11 and 13 was never about them. 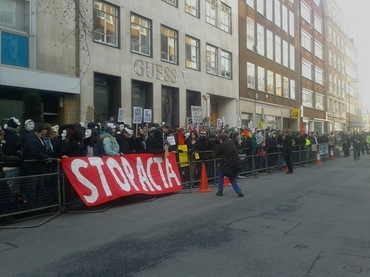 The 2012 SOPA and PIPA protests and the street protests against ACTA were certainly not about protecting Google or any other large technology company. No one goes out on the street or dresses up their website in protest banners in order to advocate for *Google*. They do it because what's been proposed threatens to affect them personally. There's even a sound economic argument: had these proposed laws been in place in 1998, when Sergey Brin and Larry Page were meeting in dorm rooms, Google would not exist. Nor would thousands of other big businesses. Granted, most of these have not originated in the EU, but that's not a reason to wreck the open internet. Instead, that's a reason to find ways to make the internet hospitable to newcomers with bright ideas. This debate is about the rest of us and our access to the internet. We - for some definition of "we" - were against these kinds of measures when they first surfaced in the early 1990s, when there were no tech giants to oppose them, and for the same reasons: the internet should be open to all of us.